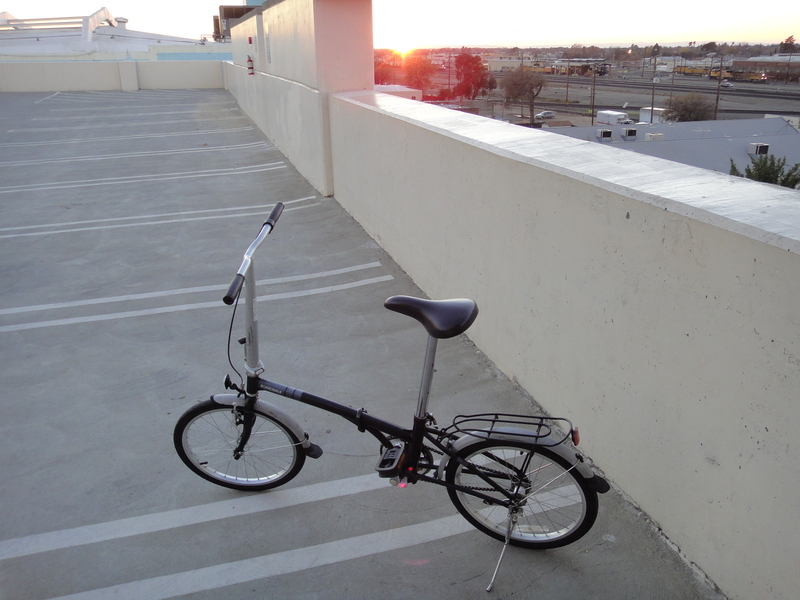 I am loving the Dahon folder despite the hard Selle seat. The fenders are keeping me dry and I ride it daily. The shrieking front brake turned out to be metal embedded in the shoes, so I put on new shoes up front and trued the wheel, always needed on a bike. I am told Dahons often had steering bars yawed a few degrees to starboard or port so mine is not unusual in that regard and it does not affect steering. 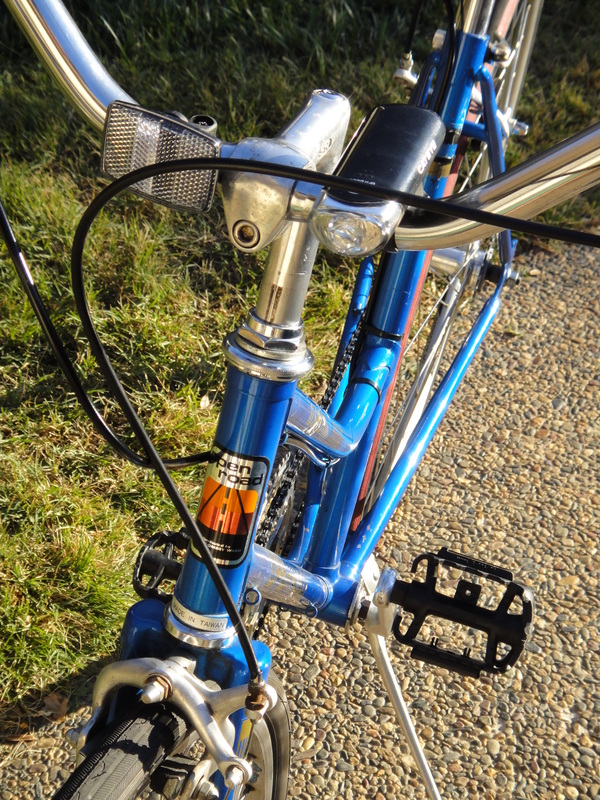 The coaster brake rear wheel is not the best, when coasting you must back pedal bit to keep the brake from dragging. That’s a drag. The bike’s weight is not really a problem for me at over 30lbs (13.61kg) but I can see replacing some of the steel parts with alloy ones would help. Sheldon Brown had chapters about his customized folder so a lot is possible. The gear ratio is good for my area but I have not counted the teeth yet. As always the seat is the weak point and an expensive part of the build if you actually want to ride the bike a lot. Here’s a singlespeed/fixie conversion of an Open Road 3000GT step-through built in Taiwan for Montgomery Wards (Monkey Wards) department store. Because I was using the stock forks and cup-and-cone BB the build took about two days. Alexrim flip/flop lined up pretty well with the French alloy cranks and chain-ring (42×16). The seat was a too-hard Bontrager Sport and the alloy side-pull brakes I pulled off a Schwinn World Sport frame that was too rusted to use. The front wheel was a period French Avocet 27 x 1 1/4 alloy rim with, interestingly, a Presta valve. Light at less than 30lbs, it was springy, accelerated fast and cornered well. Using past tense here because I have already swapped out most of the parts, going to special short 155mm Origin8 cranks, with another 42-tooth chain-ring, to better fit the bike’s shorter rider. Bought a female pattern Bontrager gel seat (made for a woman, yes, but I like it too! ), $35 on sale at Bob’s. Bike is now at Pedal Pros having the cup-and-cone BB removed, a job you don’t want to attempt. I took back my Alexrim flip/flop for my next build and converted an alloy wheel to SS, using spacers to move the axle to the right in line with the chain-ring, then dished the wheel to the left to center it in the frame. I find trueing and dishing wheels to be more fun than you might think, and very clean. So I will post this bike again when all the changes are made. But the pics show what it looked like in the 1st iteration. For a much derided ‘department store bike’ this chromo steel frame is light, flexible and strong. 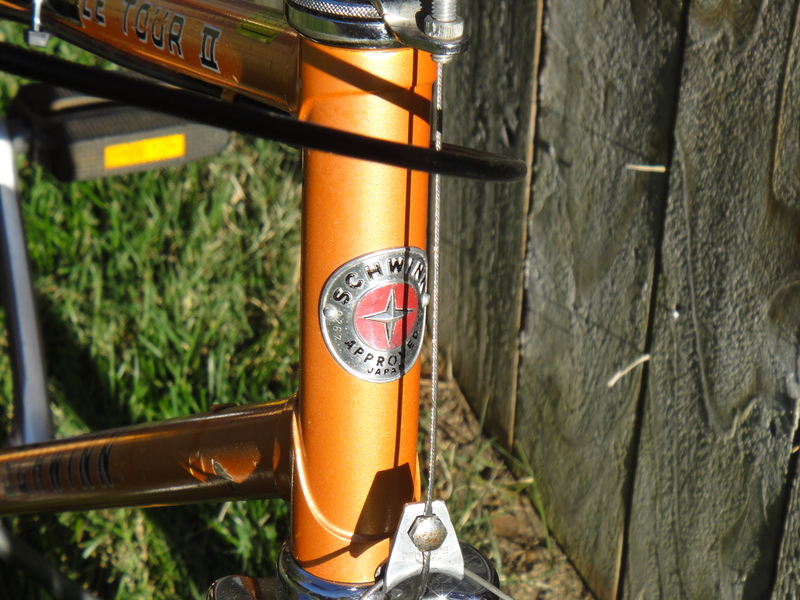 Supposed to be a heavier ‘girl’s bike’ frame, it weighed only a pound and a half more than the Schwinn World frame of the same era. This is a seriously good bike that functions as well as any built today, for a cost of around $150USD (€109.53EUR). With improvements it should also fit its rider. Here’s that Schwinn Le Tour II mixte frame conversion I posted about earlier on Fixed Gear Gallery. A correspondent tells me the frame might have been made by Bridgestone instead of Giant, great either way. 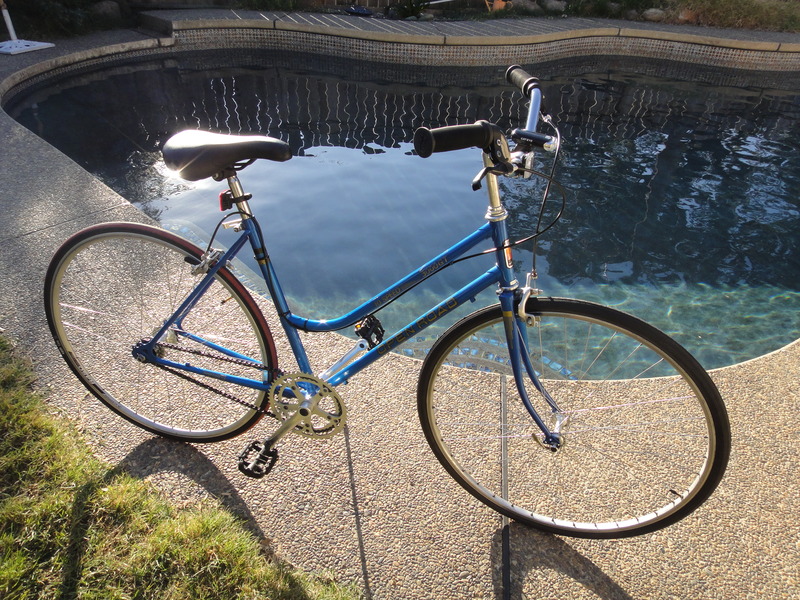 This Schwinn has also been cannibalized for parts and waits in my cold garage, bereft, for me to convert a wheel for it. It needs a new seat too and, oy vey, the cost! The mixte frame is an interesting attempt to solve some biking problems and somewhat succeeds so I want to ride it and see how well it works.